On the right side of Antwerp, at the Sint-Annatunnel you will discover a small street & finger food bar Loa. Don’t walk past it. Even if you are not hungry, go inside and enjoy the odor of all the ingredients the chef of Loa uses. This street food is world street/finger food with influences from the Belgian, French, Asian and Mediterranean food culture. They opened in 2015, and I discovered the place during winter time. The delicious pad thai (with added spices) gave me so much warmth. Since that day I visit the place a minimum of once a month, for my ‘old time favorite’: Pad Thai Veggie. If you prefer sweet food, go for the Moroccan pancake (with meat balls if you are really hungry). Just ‘snacking’? Get a fried chicken with ginger. In for some soup when it gets colder? You will find a home made sauce on the table: try it, it is not that spicy and is of added value to your food. Personal tip: if the weather is ok during this winter time, dress up and sit on the terrace and watch the local kids play basket ball on the square. 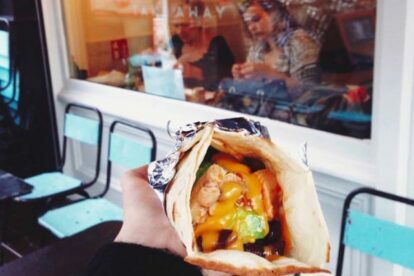 Personal tip: if you are really full from the street food, go for a walk in the nearby Kloosterstraat (check the Kloosterstraat article). It will improve your digestion.